Can you really like something but be disappointed by it at the same time? 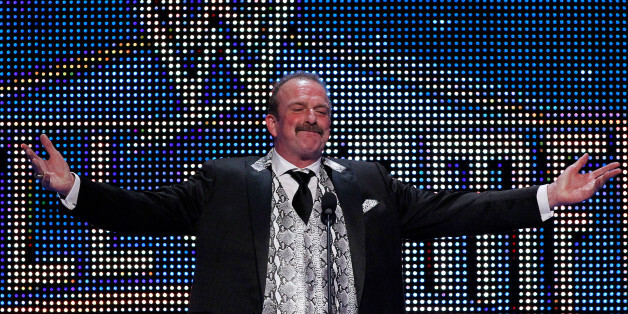 Jake “The Snake” Roberts is a former WWF (now WWE) professional wrestler, famous for his steely eyes, quiet speaking voice that sounded like sandpaper, the live snakes he used in the ring, and the DDT, a wrestling move he invented. He was one of the biggest stars of wrestling in the 1980s and into the 1990s, but his eventual fall from grace is almost as legendary as his storied career. A very public struggle with drugs and alcohol sidelined his career, and he was one of the subjects of the now-classic (infamous?) 1999 wrestling documentary Beyond the Mat, which presents an unvarnished -- if a bit lopsided -- account of the dark side of professional wrestling. Jake Roberts eventually hit a wall in 2008 at an independent wrestling show and benefit in Ohio (shown here), drunkenly staggering to the ring and refusing to cooperate with his opponent. 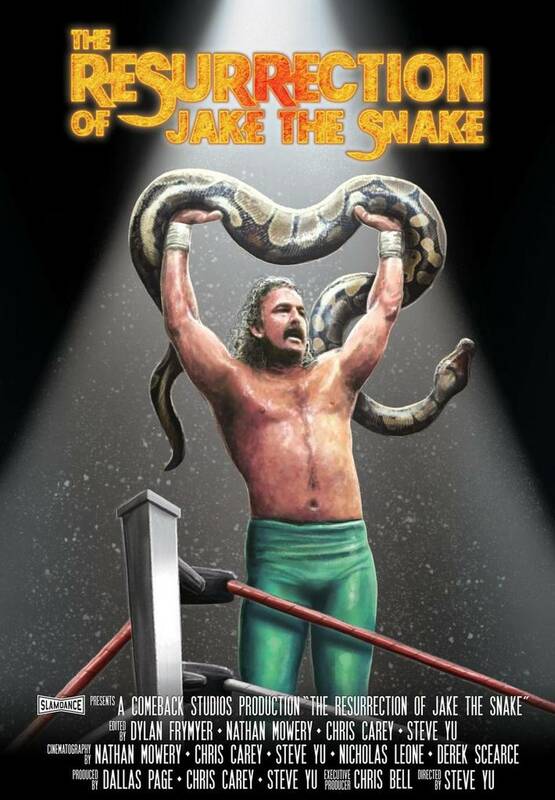 With nowhere to go but up, The Resurrection of Jake the Snake is a documentary chronicling the attempt to move upward. I’ve been aware of this production for a very long time. It seems like it was years ago (it was early 2014, so I guess it was) that Diamond Dallas Page, another former wrestler, began making the podcast rounds to raise awareness of the film and build hype for the project. 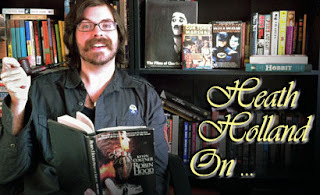 It spent the better part of 2015 making the festival rounds, and I was starting to suspect this was one of those documentaries that I would never get to see. The film was finally released to iTunes on January 12th, and that’s currently the only place it can be seen. Now that it’s here at last, the film needs to stand up not only as a working documentary, but also against months and months of hype and promotion. Can any project possibly live up to that much advance word? The answer turns out to be both yes and no. The focus of the project centers on Dallas Page dedicating himself to bringing his mentor back from the edge and probably saving his life. Page clearly loves Roberts, and cites him as the man who inspired him to begin a career in wrestling at the age of 35, which is when some wrestler’s careers start to wind down. 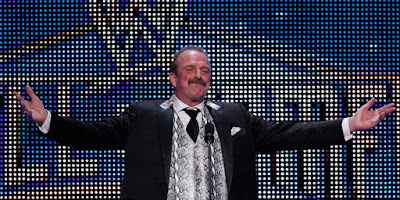 The odds were against Page, but he managed to find success and build a name for himself, and he credits Roberts with giving him the motivation to do this. When Page was injured and forced to retire, he used the time away from the ring to rebuild himself, and eventually others as well. 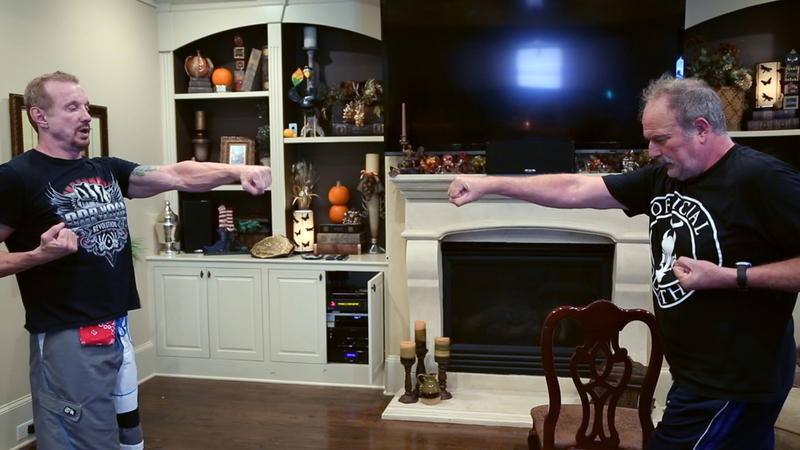 He’s the founder of something called DDP Yoga, low-impact exercise for people who have joint pain and low mobility. He’s developed into something of a self-help guru on the last few years, and many, many people swear by his rehabilitation techniques. He calls his house in Atlanta “the accountability crib,” and it seems to be something of a halfway house for anyone he feels he can help, and it’s here that he brings Jake Roberts with the understanding that Roberts will be accountable for his drug and alcohol addiction and quit for good. The human story of this documentary is where the film definitely works. Roberts bares his heart and his flaws without shame. If you’ve ever watched any other wrestling documentaries, you begin to see a pattern emerge: abused as a child, built up walls, became muscular and tough, and found fame inside the four walls of a wrestling ring while becoming increasingly far from family. Professional wrestling offers fame and fortune in return for hard work and physical sacrifice, but it’s also an isolated life that finds its performers spending most of the year driving from town to town. In one of the more memorable parts of the documentary, Roberts talks about how hard it is to wrestle in front of 50,000 people only to find yourself alone in a hotel room just a few hours later with your family far away. When you’re wired from the electricity that comes from the crowd, you need release. Trouble seems almost inevitable, and it’s that trouble that so many wrestlers have found. This is all well-worn territory, covered prestigiously in films like Darren Aronofsky’s The Wrestler, a movie that almost everyone believes is drawn largely from the real life ups and downs of Jake the Snake. Along the way, another wrestling legend comes to live in Page’s house. Scott Hall, more commonly known as Razor Ramon, is drunk and nearly crippled from years of abuse both in the ring and outside of it, but Hall, Roberts, and Page share a kinship that was born from years of travelling up and down the road together. Their wrestling family often seems to have become a substitute for their real family, and the bond that the men share with each other seems almost unbreakable. With the addition of Scott Hall to the accountability crib, we get two resurrections for the price of one. I feel really bad saying this because the subject matter couldn’t be more serious, but it does become numbing to see the same “one step forward, two steps back” chronicle of Roberts’ struggle with his own self-destructive nature. The first few times a beefcake wrestling star breaks down into tears on camera, it’s touching. But by the end of the documentary, it’s hard not to think “AGAIN?! We’re doing this AGAIN? !” You will see dozens of tear-stained confessions by the time the credits roll, and it all just becomes tedious. Sure, this documentary distills about four year’s worth of rehabilitation into 90 minutes, and what Jake Roberts and Scott Hall are doing is confronting their own lack of self worth, so maybe that’s the point. It should also be said that it must be incredibly frustrating to live with an addict, and this certainly depicts that frustration. Still, I can assure you two things: by the end of this documentary, you will be sick of hearing the word “bro,” and you WILL believe a man can cry. One of the other ways the film doesn’t quite live up to its expectations is that it was clearly a very low-budget affair, and the production isn’t the greatest. The film starts with some wrestling legends like The Million Dollar Man Ted Dibiase, Hacksaw Jim Duggan, Stone Cold Steve Austin, Chris Jericho, even Mean Gene Okerlund discussing Roberts, his talent, and his demons. This is all intercut with some of Roberts’ high spots and in-ring greatness. But then the film shifts gears and becomes a chronicle of rehabilitation, filmed on digital cameras inside Dallas Page’s house. There’s nothing inherently wrong with any of this, but it does tend to lead to a relatively bland cinematic palate. Frankly, it looks like the same reality television that the cable channels are flooded with. The filmmakers do what they can to jazz things up, but the truth is that this just looks cheap. You can’t help but wonder what a company like WWE could have done with their millions of dollars and the best production in all of sports entertainment. Then again, it was Dallas Page, not WWE, who was able to reach out to Jake Roberts, and that counts for something. That this documentary exists at all is a testament to Page’s foresight and hope that he could get through. Of course, the intention of the documentary first and foremost is to present a fly-on-the-wall look at the difficult recovery of an addict, not to win technical awards. Yet packaging and presentation are unfortunately very important in filmmaking, and this just can’t stand next to many of its documentary peers. None of that should take away from the overall presentation of the journey (and it really is a journey) Jake Roberts embarks on in this film…but it kind of does. This is the first film credit for filmmaker Steve Yu, who also contributes to the production and editing. With a crew that’s obviously incredibly small, I want to cut this documentary some slack for accomplishing what it does on an absolute shoestring. This is a true independent film, done with very limited resources, and I don’t think it would have had the same result if it had been more “produced.” While it does often feel like a reality show, it doesn’t have the scripted, fake aura that so many of them seem to share. Diamond Dallas Page definitely used YouTube and social media to hype the film, and the film unfortunately just never sheds that YouTube feel. This subject matter can sometimes be tedious and even exhausting, but I’m really glad this film exists. 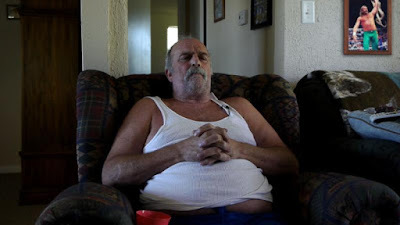 It’s not a spoiler (the title of the documentary reveals the end result) to say that Jake Roberts does indeed find resurrection; the goal of the documentary is not to surprise you with a twist ending, but to show the hold of addiction and the effects it has on not only the victim, but those around them. I’m not sure what the appeal of this story will be to people who don’t have an interest in wrestling; I’m a die-hard wrestling fan who found this documentary very challenging to my patience. I don’t know when or if I’ll ever watch it again. I care very much about this subject, but it’s a frustrating and emotionally taxing experience that I’m not keen to revisit. I can only guess to its appeal for people who couldn’t care less about these men, but it’s also a topic that seems to be getting more and more mainstream attention as wrestlers continue to die years before they should. While technically disappointing and more than a little exhausting, The Resurrection of Jake the Snake is legitimately inspiring, and it reminds us that sometimes wrestlers really do get happy endings. Yes! If not for anything, I love the fact that this exists.